It’s kind of nice to see a kid in a movie asked to say grace before a meal. Recently there was a mini controversy on the internet (where no nit is too small to pick) about meals on Downton Abbey. Historical researchers for BBC/PBS show admitted scenes usually began mid-meal because otherwise they would have had to show the family thanking God for the food. 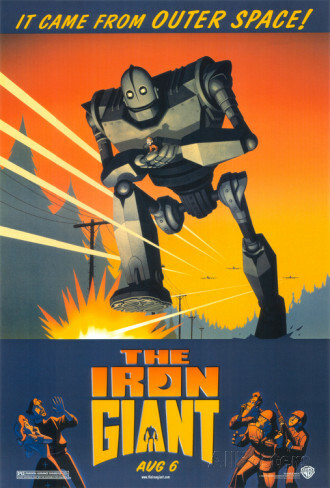 In the 1999 animated film, The Iron Giant, on the other hand, Hogarth’s mom (voiced by Jennifer Aniston) asks her son to pray for the meal. Admittedly, the prayer becomes really strange because as the boy prays he is trying to keep his mother from noticing a giant, robotic hand, but it’s still nice. The story of a boy who finds a giant robot set in a fictitious coastal town of Rockwell, Maine, was Brad Bird’s (The Incredibles, Ratatouille) first feature film. The film opens with a ship in a storm at sea off the Maine coast. The captain (voiced by M. Emmet Walsh) spies a strange creature. When the sailor, Earl, tells about his experience, he speaks in the traditional Maine accent that we were happy to hear still thriving in the state. The Giant (voiced by Vin Diesel) tries to model himself after Superman (the film was produced by Warner Brothers, owners of the copyright for the Man of Steel). Many have seen Supes as a Christ figure, so it is not surprising that there are Messianic elements in Iron Giant as well (a death and resurrection). 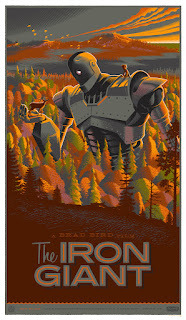 The film, though set in Maine, was not filmed there, because, as I said, it’s animated. Another film with animation, Disney’s 1977 kid’s film Pete's Dragon, is set in Maine and could have been filmed there, since only the dragon and not the people are cartoons. But it was filmed in California. This year’s version of the film doesn’t even pretend to be in Maine. Another combination of animation and live action, 1995’s Casper, the story of the Friendly Ghost, was set in Friendship, Maine, and actually filmed a bit in Maine. But mostly it was shot in California. It’s proved true in most states we’ve visited that most of the films set in a particular state are not actually filmed there. You would think the work of one of Maine’s literary favorite sons, Stephen King, would be filmed in Maine, but that’s not the case. 1985’s Silver Bullet (based on King’s novella, Cycle of the Werewolf about a kid in a wheelchair with a furry foe) is supposedly set in Tarker’s Mill, Maine, but it was actually filmed in North Carolina. King set many of his novels in the fictional town of Castle Rock, Maine (a name then used for a film production company). Cujo, the story of a rabid St. Barnard dog, was set in Castle Rock, but the 1983 movie was filmed in California. 1993’s Needful Things, with Max von Sydow as a devil disguised as a salesman, is set in Castle Rock but was filmed in Canada. Also from 1993, The Dark Half, a King work about an author whose deadly creations come to life, was set in Castle Rock, but filmed in Pennsylvania. And for some inexplicable reason, in 1993’s The Dead Zone, Castle Rock was moved to New Hampshire even though the movie was made in Canada. Other King films set in Maine but not in Castle Rock? 1995’s Dolores Claiborne, about the strained relationship between a mother and daughter (Kathy Bates and Jennifer Jason Leigh) is set on an island off the coast of Maine but was filmed in Canada. Possibly the best film made from a work by King, The Shawshank Redemption (based on the short story “Rita Hayworth and Shawshank Redemption”), an Academy Award best picture nominee, opens in the true to life city of Portland, Maine. But it was filmed in Ohio. The only Stephen King film I came across that is both set and filmed in Maine is the obscure 1990 horror film Graveyard Shift (based on a short story that appeared in the magazine Cavalier.) Some it was even shot in King’s hometown of Bangor. Even before King was published, Maine was, on occasion, the location of horror. The 1960’s gothic TV soap opera Dark Shadows spawned two feature films, 1970’s The House of Dark Shadows and 1971’s Night of Dark Shadows. Though both films are set in the fictional town of Collinsport, Maine, the first was filmed in Connecticut and the second in New York. 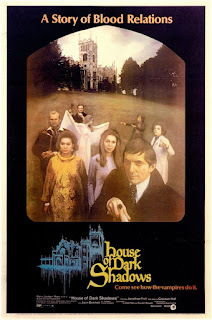 When the property was remade as parody in this century, 2012’s Dark Shadows with Johnny Depp, it was filmed in England. Birch, was based in Maine but filmed in Canada. Most surprisingly filmed in Maine is 1956’s Carousel. Made back in the day when location filming was rare, this adaptation of the Rodgers and Hammerstein musical filmed stars Gordon MacRae and Shirley Jones (both from the previous year’s hit Oklahoma) in a number of Maine locations including Augusta, Boothbay Harbor, New Castle, and Camden. That alone should allow Maine to walk through a storm with its head held high.